I’ve shared rms beauty Lip2Cheek in What’s In My Makeup Bag and in my Festive Looks so thought it was time to give you a closer look at this item which is the single piece of makeup I’ve used the most over the past 18 months. rms beauty is an ecoluxe, organic, beauty range created by and named after make-up maestro Rose-Marie Swift, considered one of the doyennes of the organic makeup scene. She created rms after experiencing health issues that showed a high level of toxic chemicals in her blood, which she believes results from her years in the cosmetics industry. She’s an advocate for education about the potential dangers of beauty products, sharing information and her experiences. Celeb fans of the award-winning range include Zoe Saldana, Gisele, Miranda Kerr and Gwyneth Paltrow. I was first intrigued by the line after reading glowing reviews of the rms concealer “un” cover up but sadly there are no colours suitable for my skin tone 😦 I really hope the options expand. 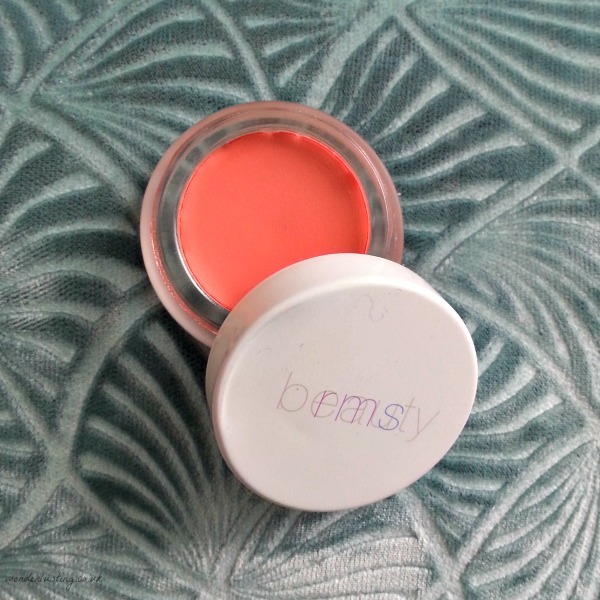 And so on to the first rms beauty buy. Smile is a pretty coral that does make me want to smile 🙂 I bought it on a lovely summer day and have worn it nearly every day since come rain or shine. I like no-fuss makeup that you can dab on with your fingers. Lip2Cheek blends in quickly and easily and works well on bare skin as well as over tinted moisturiser and foundation. I love cream blushers on my dry skin and especially in winter. It feels nourishing, a little like skincare, as a result of the coconut oil and oils. Lip2Cheek lasts FOREVER so though it’s a luxury beauty buy price-wise, it is great value taking in to account the quality of the ingredients and longevity. I bought the jar in summer 2013 and having used it almost every day since am probably only half way through the jar. As the shelf life is 12 months, I’ve now sent the jar to makeup heaven and have just replaced it with a new one. rms beauty uses recyclable packaging with frosted glass jars and aluminium lids. I found that carrying my lip2cheek around in my bag, teeny bits of paint chipped off the lid. Just something to be mindful of. So I love Smile lip2cheek. Any moans? Not specific to the product, I love using my fingers but also struggle with the hygiene pitfalls. 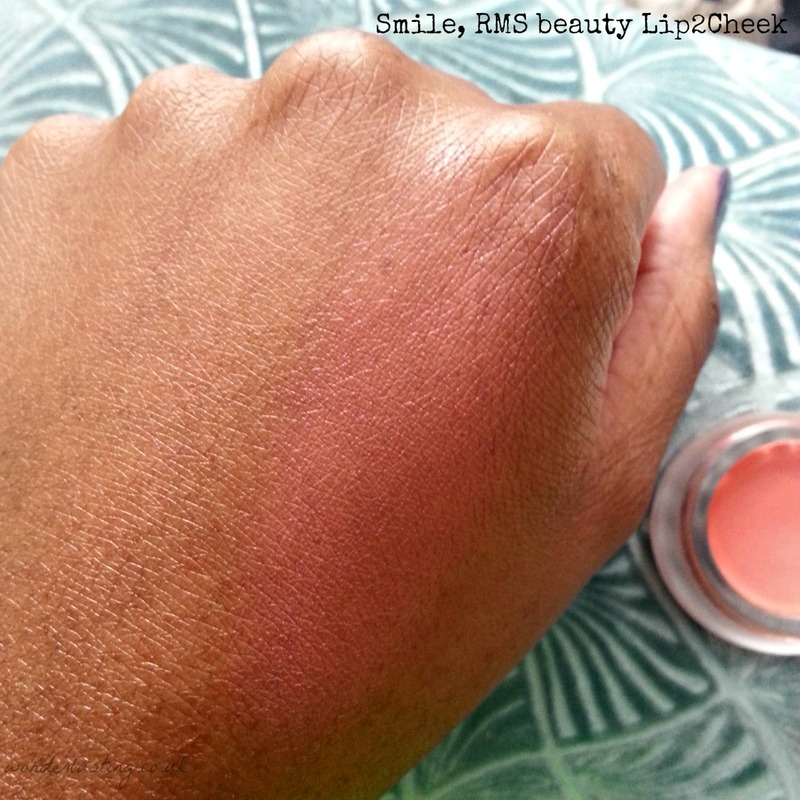 Here are swatches of all the Lip2Cheek colours on dark skin. Bear in mind these are very heavy swatches to see the colour at its most intense. All can be blended down to a sheer, natural finish on the skin. Promise: “A warm salmon-pink with a very subtle golden shimmer”. This pulled golden brown on me. Modest: “A fresh, rich berry pink color”. Not very berry on me. 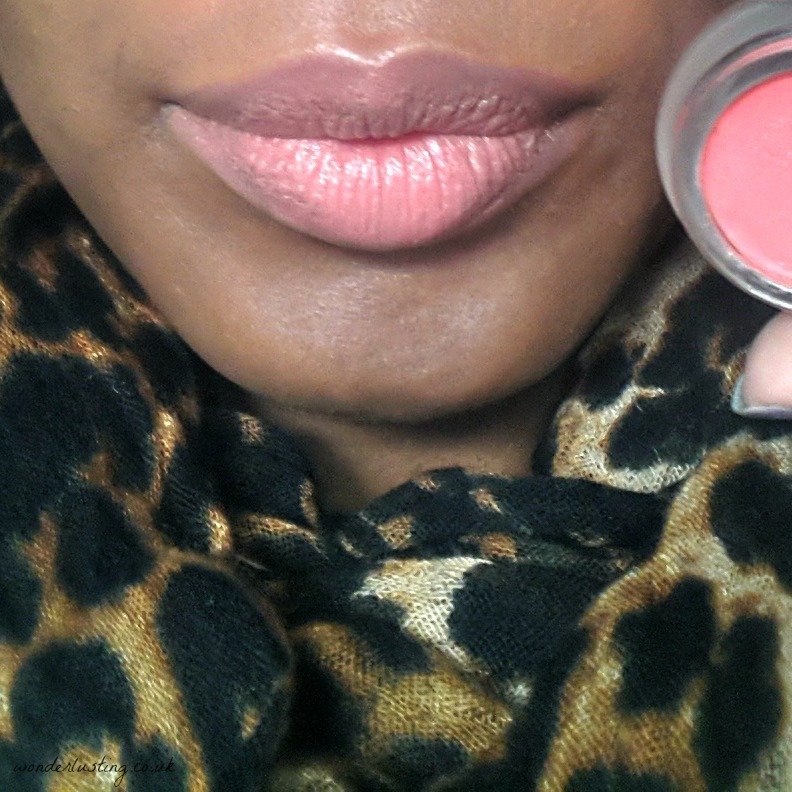 Illusive: “A matte burnt rose hue with a hint of plum.” I really like this colour – it pulls more plum than rose on me. Diabolique: “A rich burgundy coloring and intense depth make this sultry shade a must for anyone feeling adventurous.” I love vampy shades so this gorgeous deep colour is on my lust list! Curious: “A bright wearable golden orange.” As described, might be another one to add to my orange lip list. 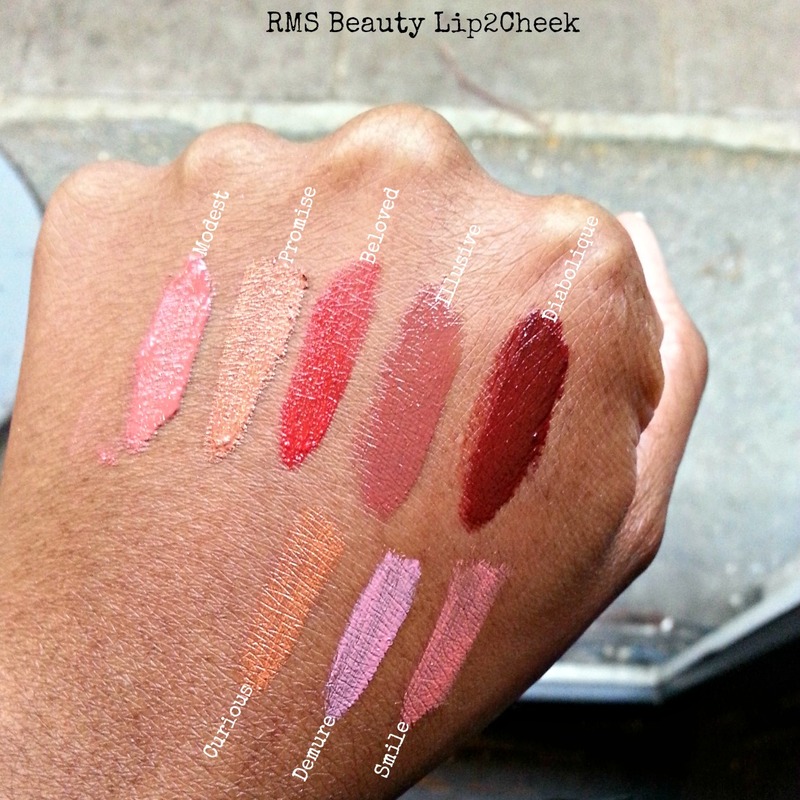 RMS Beauty Lip2Cheek, £28, visit rmsbeauty.com for UK stockists. Also, aaawwww, you can so rock oranges and corals. It’s insane. Small spatula is a great idea which I hadn’t thought of, instead once a week I’ve been wiping away the top layer. Good ole yellow undertones. With me purples (which i adore) often turn me grey. Lip2Cheek is to die for. I ended up using up Promise (which seems impossible) but its so lovely on the skin. Especially lips. Diabolique is such a gorgeous, seductive, vampy colour. Smile looks so perfect for you. Its a nice pick-me-up shade for the winter. Thank you – it really is – kicks all the grey and cobwebs away. Hi-5 on finishing a pot 🙂 I need to have a proper play with the other colours to see how they behave. I know this post was over a year ago but I just discovered rms smile and am in love! Isn’t it THE best. I’ve just finished the jar (it really lasts forever) and of course have immediately replaced it.